Free Anti-Malware - Is Malwarebytes Safe to Use for Windows? Free Anti-Malware – Is Malwarebytes Safe to Use for Windows? Some people have asked in discussion forums or blogs, "Is Malwarebytes safe to use?" It is a good question since there are plenty of rogue and misleading programs that are scaring internet users and later steal their identity and money. It is good to be informed and aware of the fake antivirus and registry cleaning software so you won’t become victimized by scammers. Malwarebytes Anti-Malware (MBAM) is legitimate software that scans, detects and removes viruses, worms, Trojans, rootkits, dialers, spyware, and other type of malware that infects the Windows operating system. MBAM was first released to the public on January 2008 after having undergone beta-testing in 2007. MBAM is the replacement of the program RogueRemover, which was developed by the same vendor. MBAM is now one of the most widely used anti-malware programs by home and corporate users. Most help and support forums are recommending MBAM to their members if they want to remove malware that antivirus software failed to remove or detect. It is also recommended as an on-demand scanner for users who wants to verify that nothing is missed by antivirus protection for Windows. Even computer technicians recommend MBAM to their clients after they’ve cleaned the PC. MBAM is not only safe but a recommended program to use in Windows. If MBAM is Safe, Why Do I Have to Register? There is only one edition of Malwarebytes Anti-Malware which you can use to scan and remove security threats in your PC. However, the vendor of MBAM still needs to pay their bills (dedicated server, developer software, etc.) and staff which makes the software a great program and continues to provide free anti-malware to home users or for personal use. The free edition of MBAM receives free database updates to detect new types and variants of malware. Imagine how expensive it is to support the number of downloads per day for the installer and the detection signatures for MBAM. It surely costs a lot so the maker of Malwarebytes decided to offer different license types: Free, commercial and corporate. MBAM is safe because it is not required to register for a license unless you are going to use MBAM in a business or corporate environment. You can also register a license for MBAM even if you are a home user and by registering MBAM you’ll enjoy the real-time protection, scheduled scanning, updating and fast support. See the image at the left on available on-access protection in MBAM. Free users of Malwarebytes enjoy the free license in using the program to manually scan and remove malware but for personal use only. Commercial license users of MBAM or the registered edition of MBAM receive a lifetime license which means they won’t be receiving additional charges in using the program. It’s a one-time fee ($24.95). Business or corporate users are the ones that need to pay an annual license fee. mbam.exe, mbamgui.exe, mbamservice.exe, zlib.dll, mbam.dll and mbamext.dll – Located in the C:\Program Files\Malwarebytes’ Anti-Malware folder. mbam.sys and mbamswissarmy.sys – Located in the C:\Windows\System32\drivers folder. If you receive a warning message that Malwarebytes’ Anti-Malware is not safe or can degrade the performance of your PC, do not believe it but clean your computer by using Malwarebytes to remove the rogue program that is giving false warnings or fake alerts. 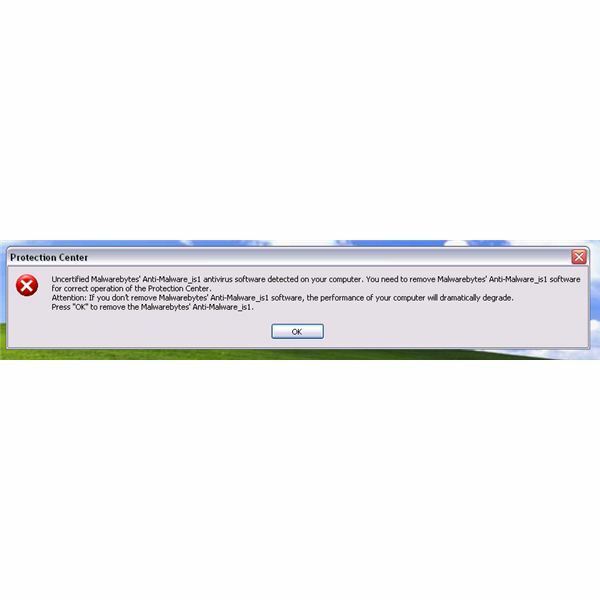 The above alert is an example of fake warning message by rogue software. Rogue software is known to exploit, scare and provide disguised threats so they can get more victims. For moreinformation, please read this Free Anti-Spyware Programs: Threats in Disguise article.